Structured Academic Controversy – Lewis and Clark Edition! Man, I’m gonna really have to fake-it-to-make-it today. But then class started, and we got rolling with our topic and activity. By the end of my first block I knew I wasn’t gonna have to “fake it.” Today was AWESOME! And it was made possible by the Structured Academic Controversy (SAC) activity I found using Stanford History Education Group. If you aren’t using SHEG in your classes . . . get on it! Seriously one of the best resources out there for incorporating and teaching with primary sources. The SAC provides a controversial questions, documents for research, and the procedure for students to participate in small group debates. Students learn how to argue with evidence! And middle school students LOVE to argue! January 27th marks the liberation of Auschwitz-Birkenau, the largest Nazi death camp. In 2005, the United Nations established International Holocaust Remembrance Day commemorating the tragedy of the Holocaust that occurred during the Second World War. And while you may not be teaching a class that specifically focuses on the events of 1941-1945 as well as earlier discrimination and persecution under the Nazi government, it does provide a chance to connect those events to similar genocides both past and present. And to other acts of discrimination and persecution happening around the world and in the United States. By remembering the Holocaust, we can honor survivors and challenge ourselves to use the lessons of their experience to inform our lives today. As a poly sci junkie, I’m torn. 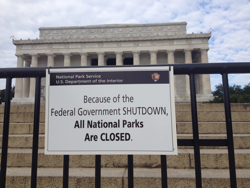 The 2018 government shutdown is bad for just about everybody. And it seems like it happened over something that most Americans want to see happen – protection for Dreamers. A Fox News poll says 86% of us support DACA. A CBS poll reports 87% supporting the idea. But the shutdown does create an opportunity to jump into all sorts of conversations involving civics and procedure and policy and elections and checks and balances and three branches and media bias . . . well, you get the idea. If you haven’t already, this week might be a good time to jump ship on your scheduled curriculum and spend some time making connections to the government side of the social studies. Over the past two years, the Kansas State Department of Education has focused on improving the civic engagement opportunities provided to the children of our state. Step one toward this goal is the creation of the Civic Advocacy Network Award Program that will launch this fall. Do you ever find yourself watching the news and they are discussing a political figure who holds an important role in our government and you have no idea who he or she is? Or maybe the opposite happens — you are teaching about the Constitution or the first Presidential Cabinet and you ask yourself, or even better – a student asks, “Who is the Secretary of Treasury right now?” No? Just me? Senior U.S. Government was added to my course load this year and I vowed to make sure that my students (and let’s be honest…myself included) know the important officials in our national government. I created these posters (updated as of 7/30/17) that have the official portrait of government officials and jobs in the executive branch – well most of them (sorry Administrator of the Small Business Administration, you didn’t make the cut. But you are still very important). Also included are important White House staff members, congressional leaders, Supreme Court Justices, and Kansas congressmen (I could not contact Kevin Yoder to get a hi-res photo because I don’t live in his district! The photo is taken from his website) and governor. I included Elaine Duke as the Secretary of Homeland Security because she is the current Deputy Secretary and will most likely be moved up to head of that department. Also for my Kansas people, Sam Brownback is still awaiting Senate approval to move into his new role as Religious Ambassador so I included Jeff Colyer as well, he will serve out the remainder of Governor Brownback’s term until the next election in 2018. Almost all of the photos were taken off of the official website from each individual. Some people didn’t have high-resolution photos available for download on their official website so those had to be found the good old fashioned way. Sources are linked in the file. Both editable and non-editable versions are available. You will need the font- KG Sorry Not Sorry Chub- to edit the labels. See the link to the Google Drive folder below and download! Hope this is helpful for you! If anything, it can be a good way to cover up a blank wall. Happy teaching! **UPDATE: Since completing these posters back in June, I have had to edit them three times due to the frequent changes in our current administration! I will try to keep them updated as people are replaced.